Centuries ago, scientists began reducing the physics of the universe into a few, key laws described by a handful of parameters. Such simple descriptions have remained elusive for complex biological systems – until now. 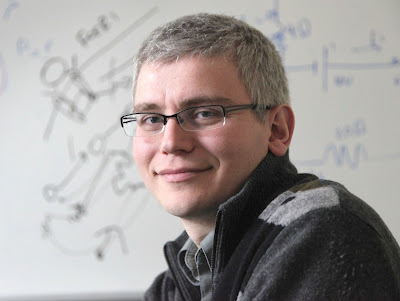 Emory biophysicist Ilya Nemenman has identified parameters for several biochemical networks that distill the entire behavior of these systems into simple equivalent dynamics. The discovery may hold the potential to streamline the development of drugs and diagnostic tools, by simplifying the research models. The resulting paper, now available online, will be published in the March issue of Physical Biology. "It appears that the details of the complexity of these biological systems don't matter, as long as some aggregate property, which we've calculated, remains the same," says Nemenman, associate professor of physics and biology. He conducted the analysis with Golan Bel and Brian Munsky of the Los Alamos National Laboratory. Nemenman wanted to find similar parameters for the incredibly complex dynamics of cellular networks, involving hundreds, or even thousands, of variables among different interacting molecules. Among the key questions: What determines which features in these networks are relevant? And if they have simple equivalent dynamics, did nature choose to make them so complex in order to fulfill a specific biological function? Or is the unnecessary complexity a “fossil record” of the evolutionary heritage? For the Physical Biology paper, Nemenman and co-authors investigated these questions in the context of a kinetic proofreading (KPR) scheme. KPR is the mechanism a cell uses for optimal quality control as it makes protein. KPR was predicted during the 1970s and it applies to most cellular assembly processes. It involves hundreds of steps, and each step may have different parameters. 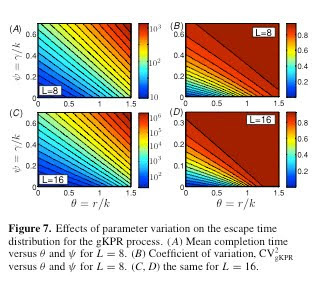 Nemenman and his colleagues wondered if the KPR scheme could be described more simply. "Our calculations confirmed that there is, in fact, a key aggregate rate," he says. "The whole behavior of the system boils down to just one parameter." That means that, instead of painstakingly testing or measuring every rate in the process, you can predict the error and completion rate of a system by looking at a single aggregate parameter. Nemenman is now collaborating with Emory theoretical biologist Rustom Antia, to see if the discovery can shed light on the processes of immune cells. In particular, they are interested in the malfunction of certain immune receptors involved in most allergic reactions. "We may be able to simplify the model for these immune receptors from about 3,000 steps to three steps," Nemenman says. "You wouldn't need a supercomputer to test different chemical compounds on the receptors, because you don't need to simulate every single step, just the aggregate." Just as the discovery of an ideal gas law led to the creation of engines and automobiles, Nemenman believes that such simple biochemical aggregates could drive advancements in health. Is this about better understanding diverse systems by looking for a commonality of purpose among their functional apparatus? Yes, in many respects it is. One question we looked at is what is the common function that these diverse functional organizations with multiple parts and features have? And it turns out that the functional part is pretty similar across many of them, but the same function may be achieved in many different ways.